This is true. 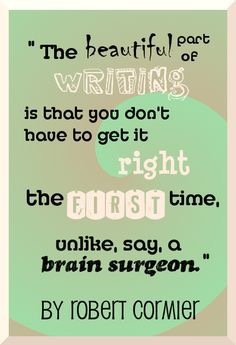 If I only had the chance to publish my first draft, I’d bang my head against the wall and think why is it so bad? So You Want to be a Published Author? First up. Apologies for no blog last Friday. Sickness is not my best friend. So you want to be a published author? Yes. Me too! Many people that I’ve met think that trying to be a published author is a waste of time, as there’s no guarantee of getting published and making the big time. Those people are often the people who tell me it’s not worth being an actor for the same reasons. I understand where they’re coming from, but there’s nothing wrong with passion and dream. Providing you’ve got a back up, then why shouldn’t you give it a go? First up. Finish your story…or else you’ll fail. If you want to get published through a certified publisher, then you need to get yourself a literary agent. Getting a literary agent is not easy. They are very selective about their choices. This is why you need to do your research and prepare yourself for a lot of rejection. The link below provides you with a detailed list of literary agents. If you don’t want to go through the literary agents you could become a member of this website. It’s a website that’s run by Harper Collins Publishers. Here they accept all types of books and you don’t have to pay for a membership. There are many people on this site, who want their works published. You won’t get paid on this site, but your work can be read by the public and read in e-book format. If you’re lucky, you might get spotted by the talent scouts. There have been quite a few success stories on there of authors getting published. I have one of my free books on this site. It’s a good way to promote. If you don’t want to wait, then you should consider self publishing. However, you’d be doing all the work yourself. The writing, cover, blurb, promotion and print. The whole caboodle. You could go the traditional route of making a paper copy…which is expensive, or you could find a self publishing website like CreateSpace. CreateSpace are free, and you can get paid. There may be literary agents hanging around on there. My main advice is be prepared. If you choose a literary agent, then be prepared to suffer rejection. If they publish you, then be prepared to pay an agent fee. If you choose a site like Authonomy, then be prepared to not get spotted. If you get spotted, then you’ll have the same procedure as with a literary agent. If you choose self publishing, then be prepared for promote, promote, promote and lots of work. Read up on advice from well established authors. Be prepared and determined. You can also find lots of books about writing and there are lots of self help sites too.